Cossack: Quiet you. There we go. All done I think. 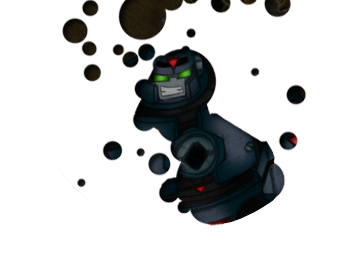 The Transmetal armor seems to be operational. How do you feel Rebel? Ring: Ugh…my head. I need Cola. Ring: Woah! Sweet bodies. I…AH KALINKA!!!!! Kalinka: Why are you acting that way Rebel? Aren’t you glad to see me? Drill: Well Ring, don’t you have something to say? Drill: No we didn’t. Long story. But, dude, you killed people! Ring: I know…I know already! But what about him? Dive: Heh, I’ll use you as target practice…Hmm? You talkin’ to me puissant? That crap has been settled. Ring: It has?! Look, I messed up. I am sorry. I understand if you can’t forgive me. Dust: Well…you know what? It’s too much work to argue this. Let’s just let bygones be bygones for now. I’d rather not mention that War. Cossack: True. Very well Rebel, we forgive you. However, one more mess up, and you are gone. Rebel? REBEL! Ring: Ringman, now with Kung Fu Grip! Drill: It’s no use Doc. This feels…right. Well except our lack of a home. Pharaoh: Yeah about that…where are we going to stay? Gauntlet: NO! I don’t even want to see another team for a month! Drill: Thanks for letting us crash here Reg. Blizzard: No problem. Now Zapper and I can be together. Dive: Spare me your love. Where’s your booze? Dive: Well then I’ll get some. Come on kid, I’ll buy you a bottle of brandy. Dive: Do it or I’ll pelt the cat. Bright: *Sigh* Brandy it is. Yamato: So how long are you planning on staying here? Blizzard: This is no time to complain! Rejoice! Jay: Hells yeah! I got salvia! Anyone want a hit? Megatron: Gah! That insolent Galvatron thinks he can take command of my troops eh? Rumble: Uh boss, I thought you were Galvatron. Starscream: Well oh humble leader, what shall we do now? Megatron: Watch your tongue Starscream. We have waited for the fleshlings and primitive machines to end their conflict so that we may rise up and conquer it! Now is the time! Starscream: Fool! If I were leader, we would have won fighting with Galvatron but no! Thanks to his incompetence those Maniacs stopped us! Megatron: You’re an idiot Starscream. Which Decepticons remain loyal to me? Soundwave: Designations Soundwave, Rumble, Frenzy, Lazerbeak, Ravage, Thundercracker, Skywarp, and Astrotrain. Starscream also remains. Megatron: Hmm interesting. Very. What is the news on the Autobots? Soundwave: Optimus Prime has reclaimed Cybertron. He is fighting Galvatron and his forces as we speak. Skywarp: Who shall we strike first? Megatron: I say...the ones called Comrades! Starscream: WHAT?! Why not the Maniacs, or strike Prime while he has his hands full? Megatron: SILENCE!!! This group interested me at the Movie Premiere. * I wish to crush them with my bare hands. Soundwave: As you command Megatron. Frenzy: Yeah Soundwave! Let’s do it! Jay and Dive: Chug, Chug, Chug! Bright: I don’t feel so good. Flame: I love you guys man! Blizzard:…have you been talking to those stoners? Kalinka: No. You don’t need it. Kalinka: YOU PROMISED YOUD CLEAN UP! Kalinka: You didn’t even last a week! I knew it. Cossack: What? I am your father! I can do what I want. Besides, how does that make me a bad father? Kalinka: I give up. You can try all you want, but you will never be a normal father. Cossack: Would you want me to be normal? Narrator: Suddenly the Decepticons blasted through the wall. Megatron: Pathetic creatures, we shall kill you all! Dust: Dammit! I wanted a break from this! Starscream: You won’t be getting one you little worm! Drill: Why the hell are you here? Megatron: To kill you all! Ring: I show you kung fu! Megatron: What trickery is this?! Starscream: Your leadership skills are showing Megatron! Flame: Hey guys, I fixed the wall! Megatron 2: Yesss….My namesake. I shall have to stop you myself. Megatron 2: Yesss….who could forget you. Flame: I fixed it again! Galvatron: So you take control of my troops me from the past! This is bad comedy! Megatron: I AM NOT YOU! Blizzard: Why does this need to be done here? Starscream: Who do I try to betray? Drill: Well…technically all of them. Waspinator: If big botz want to fight, they should do it in space! Dive: Hey! That is mine! Cossack: Well…I think we need to do something about the citadel. Tomahawk: WHAT ABOUT OUR BASE?! Narrator: And so as we leave our Comrades, they are patching up the base. But what lies in store for our heroes? Megatron 2: Noooo! I AM Megatron! Starscream: Until these imbeciles realize that I am the ruler of the Decepticons, we are failures.